The Prospect Park area is in Brooklyn. It includes its namesake park, plus the neighborhoods of Park Slope, Prospect Heights, Windsor Terrace, and Prospect Park South. Park Slope has long been a haven for interracial families, lesbians and gays, and everyone else with a certain kind of groove in NYC; this upscale but downhome neighborhood can be joked about as the Berkeley of New York City. The granola eating transplant crowd might make you queasy at times and nostalgic for crackheads, but the neighborhood itself is beautiful. Boutiques, cafés, bars, health food stores like the 30 year old Park Slope Food Coop , and attractive young people pushing strollers. Also home to a sizeable lesbian community since the 1970's. Take the B or Q to 7th Ave, the M or R to 9th St, or the F or G to 4th Ave or 7th Ave and walk the neighborhood. Prospect Park  is large, beautiful and green. Ice-skate here in the winter. Fly kites and enjoy free weekend concerts in the summer. While staying hip and vibrant, "the slope" as it is commonly referred to, also enjoys its share of wealth. The quaint, tree-lined streets closer to the park house ornate, brownstones, townhouses, full service apartment buildings, and even a few full scale urban mansions on the parkside. These residences include the homes of names such as Senator Charles Schumer (D-NY) and famed actresses Jennifer Connelly, Steve Buscemi and Maggie Gyllenhaal. Check out 5th Ave for the restaurants and bars. Prospect Heights is just north of Prospect Park, and traditionally considered part of Crown Heights. It features the Brooklyn Museum, which is first-rate but often overlooked due to the museums in Manhattan. 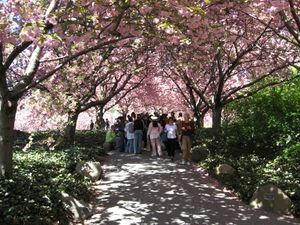 A block away from the museum is the Brooklyn Botanic Garden. 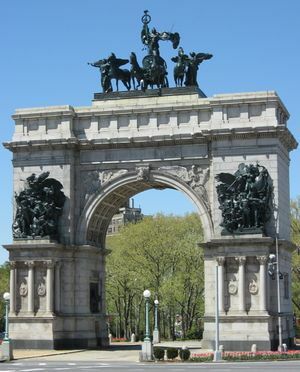 The 2 or 3 train will take you to Grand Army Plaza, just at the corner of the park; it will also take you to Eastern Parkway, near the Brooklyn Museum and the Brooklyn Botanic Garden. The B or Q will take you to Seventh Avenue near the corner of Seventh Avenue and Flatbush. The F and G will take you to Seventh Avenue at the corner of Seventh and Ninth (be aware that, despite the name, this is on the other side of the neighborhood from the B/Q station) or to 15th Street-Prospect Park at the Western corner of the park. Finally, the R can take you to Union Street, which is at the corner of Union St. and Fourth Ave.
Cherry blossoms in bloom at the Brooklyn Botanic Garden. Unfortunately for the budget traveler, Park Slope has very little in the way of budget or midrange eateries, since it is an expensive neighborhood. However, there are some good low-price places. On the far side of the park (near Prospect Park B/Q station) there are a few new cafes and restaurants on Lincoln Road, moderately priced. This page was last edited on 28 March 2017, at 12:30.